This project is the first of its kind, In-situ Slum Re-development Project at Kathputli Colony spread over 5.22 hectares, near Shadipur Depot by Delhi Development Authority. The project envisages construction of 2800 EWS units for the squatter families of Kathputli Colony. In a move to provide better living conditions for urban poor, the development work at Kathputli Colony project would act as a pilot project in Delhi and also set a benchmark for many such projects to follow to make Delhi a slum free State. Beside redevelopment of this colony, we will be developing high-end residential complex having approx. 3 lacs sq. ft. saleble area and a commercial complex having approx. 2.80 lacs sq. ft. saleble area. The project is located in heart of city and surrounded by posh commercial and residential localities of Central Delhi and distance from Connaught Place is just 5 min. drive. The initial development activities has already been started. At Kathputli Colony near Patel Nagar in west Delhi, strings and puppets are making way for the capital's tallest building. With a planned height of 190m, and 54 floors, Raheja Phoenix will not only be the city's first true skyscraper (generally defined as a building taller than 150m) but also a sounding board for its elite's residential preferences. In a city where garden bungalows are the height of aspirational living, and lower floors fetch a premium in residential towers, selling apartments worth crores at vertiginous heights might prove a challenge, feel experts. But they also believe the success of this project could be the long-awaited stimulus for a gradual transformation of the city's skyline. Anshuman Magazine, head of international property consultants CBRE, says the time has come for Delhi to grow vertically, especially because land prices have skyrocketed. And breaking from the city's mid-rise trend - residential buildings of 12-15 floors - some developers are already constructing premium residential towers of 20 or more floors. Parsvnath Developers, which has both residential and commercial buildings in Delhi, has planned more than 20 floors at two of its projects: La Tropicana at Civil Lines and Parsvnath Paramount at Subhash Nagar, near Rajouri Garden. DLF, too, plans to build 20-odd floors at its projects in Greater Kailash-II and Moti Nagar. With a planned height of 190m, and 54 floors, elite residential colonies in Delhi will soon have to measure up to Raheja Phoenix, the capital's tallest building. The developers sound bullish about skyscrapers. R K Arora, CMD of Supertech, which is building the 255-metre, 60-storey North Eye project in Noida's Sector 74, says, "The trend has always been popular in Mumbai but is now catching on in north India. We are going to launch another high-rise project soon in Sector 94." Says Raheja Developers' chairman Navin Raheja, "Community living will become a part of life in India soon, with condominiums becoming the norm. It's time we capitalized on the trend in Delhi as well." His company has plans for another skyscraper project in the NCR: the 57-storey Revanta in Gurgaon. Another company, Ireo, recently announced it will build a 51-floor project, Victory Valley, in Gurgaon. Is it a lasting trend? With rates starting around Rs 8,800 per sq ft, these apartments are by no means cheap, but Magazine says regulatory hurdles and poor infrastructure, not price, could hobble the trend. "FAR (floor area ratio) restrictions mean that you pay more if you go vertical, as compared to the same FAR nearer ground. The ratio needs to be addressed to allow really tall buildings to come up in Delhi," he says, adding that sanitation and traffic issues also need to be addressed to promote high-density living in towers. While the Phoenix project will be remembered as a milestone in Delhi's vertical rise, it will not pitchfork the city into Mumbai's league where several buildings taller than 200 metres are under construction. But the Delhi project can draw some solace by association, as it is a joint venture with the company that built the world's tallest building: the Burj Khalifa in Dubai. It also exceeds the city's currently tallest building - the 112-metre Civic Centre - by more than a Qutb Minar's length. 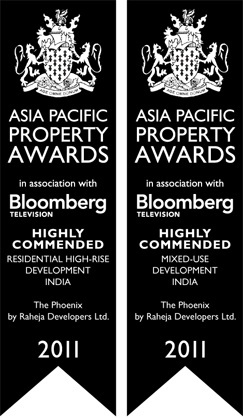 Housing residential, retail and commercial structures across 14 acres, the Phoenix is one of DDA's few public-private partnership success stories. The project will also create 2,800 dwelling units for the slum dwellers it has displaced. In a landmark deal, Raheja Developers, Delhi has inked a $ 204 million (about Rs 1,020 Cr) contract with Dubai-based Arabtec construction company that built the tallest tower in the world, Burj Khalifa in Dubai and also, landmark buildings like Okhta tower in Russia, Emirates Palace Hotel in Abu Dhabi and also have the credit of making the Palace of the king of Dubai. Initially, Arabtec will start construction on three of the Raheja projects, Raheja Revanta, Raheja Phoenix and Raheja Srishti. The Raheja Phoenix Project, Delhi, will be the first project to be constructed by them which would be one of the tallest skyscrapers in India. It is learnt that these projects in Northern India require specialised technology and manpower quality which was not up to the mark with any of the contracting companies in India. Raheja Phoenix in Delhi will be over 54 storeys with a helipad and it will have first of its kind skybridge with an infinity pool at the 46th floor overlooking the Aravallis. The Raheja Phoenix project will have the tallest skyscraper in Delhi located at Patel Nagar,New Delhi and will comprise 54 storied tower with a skyclub and helipad. The height clearance for both the buildings has been cleared by DGCA. Using the latest international state-ofthe-art technologies, Arabtec will also construct 2800 EWS houses under slum redevelopment PPP project of Rahejas with DDA in a time bound manner of two years. While talking to Raheja about their tallest building, they mentioned that the project would redefine the skyline of Gurgaon and will be much ahead of the construction standards in the country. These homes will be digitally controlled and shall have high standards of home automation controlled through ipad, iphone, blackberry or desktop. One would even be able to switch on and off fans, lights, TV, music , air-conditioning and curtains enabling you to interact with your home. It will be a self sustaining green project to take care of energy and water conservation. The project will also have a large spa facility under arrangement with Amatrra which has been awarded the 'Best Lifestyle Day Spa' by Limca Book of Records and visited by the who's who of the country.Amatrra homes in the complex will be sold by invitation only. When asked why Arabtec chose to form JV with Raheja, Martin Pinder, Director,Arabtec quoted "after talking to many developers in India, we concluded that Raheja Developers is the most professionally managed, technology driven,system oriented and almost debt free company with strong cash flows. They have a happy customer base and have to their credit several international and national level awards like 'Best Developer Worldwide' ,'Best Developer in India by Euromoney' and over 40 other awards recently. And that we found them to be reliable long term partners". Just what Qualifications do you have to have in order to work in the Accounting/Bookkeeping field? The Advanced Diploma of Accounting falls into the Business, Management and Finance category of courses. This qualification was created to reflect the function of staff in accounting and seeking professional identification. People looking for professional identification as well as registration will have to be sure the selection of competencies include current taxation registration requirements. Do you seek additional information with regards to your education choices? Are you looking to start your career or you are looking to change your current job? There are various things that you can try to help you create a better future for yourself which include: TAFE Courses, College Courses, University Courses, Government Funded Courses, Online Courses, Distance Education Courses and Short Courses. The primary subjects for the Advanced Diploma of Accounting contain: Communicate within the place of work; Work with technologies in the workplace; Implement safety and health methods within the workplace; Administer principles of professional practice to operate within the financial services field. Prerequisite: Prepare tax returns; Maintain budgets and also forecasts; Prepare fiscal reports for a reporting entity; Use and also manage internal control methods; Supply management accounting details; Sectoral core: Keep an eye on business governance activities. Additionally electives. Entry specifications with regard to this specific course: Year 12 or equivalent. Work Outcomes plus Earnings: Accountant - Accountants plan & deliver accounting programs & expert services in relation to tax & the financial transactions with organisations & individuals, & advise on relevant record-keeping & compliance specifications. Earning potential beginning at $61,672 each year. Bookkeeper - Bookkeepers maintain & look at records with financial transactions in account books & computerised accounting programs. Earning potential commencing at $45,448 per annum. Accounts Clerk - Accounting Clerks monitor creditor & debtor accounts, handle related routine paperwork, & calculate & investigate the cost associated with wages, materials, outgoings & additional operating costs. Earning potential commencing at $41,496 per annum. Provider Profile 1: Welcome to the Australian Institute of Commerce and Language where there are top quality education pathways that ensure that you establish your own accomplishments. AICL specializes in vocational education and training as an effective process to be able to develop studies including a great profession. You'll be provided with the appropriate skill essential in an changing and dynamic economic climate where all our training courses are actually intended in order to offer education that is simultaneously functional along with career driven. We have merged those components of functionality to make sure of job success but contributed a higher level of assessment so that our pupils can take advantage of our vast network of articulated universities. At AICL we realize that to ensure our students to establish their own success, we must continually be on the cutting edge by providing suitable innovative courses exclusively at AICL, together with TAFE NSW - Sydney Institute along with developing our network with industry associates. Provider Profile 2: TAFE SA is a significant piece of the Department of Further Education, Employment, Science and Technology (DFEEST), and takes on a key role within the progression of South Australia's workforce in addition to community. In building the State's talent base, Institutes deal with industry and business to be able to give relevant, high-quality, business schooling and training to better link capabilities along with training together with employment options, ensuring sustainable employment within the state. TAFE SA employs somewhere around 2400 employees, in a variety of lecturing, administrative along with management roles. If you are searching for more information regarding TAFE Short Courses etc, you are on the right trail. http://www.nationalcoursesdirectory.com.au has all the courses on one massive website! Click the link: http://www.nationalcoursesdirectory.com.au.